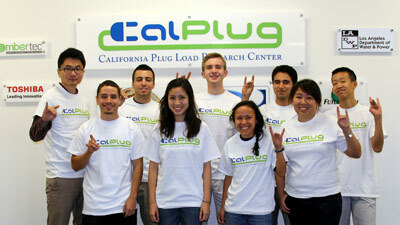 The CalPlug ZotWatt team has been selected to compete in the 2014 Max Tech & Beyond Design Competition for ultra-low-energy-use appliances and equipment, which is managed by the Efficiency Standards Group (EES) at Lawrence Berkeley National Laboratory and funded through the DOE’s Building Technologies Office (BTO). The ZottWatt team aims to decrease the overall power consumption of the home entertainment system by changing the power states of the peripheral devices by adapting to predicted user behavior patterns and using innovative sensor technology. Current best on the market technologies focus on timers or motion sensors that require user input. The ZotWatt project aims to reduce energy consumption by supplying power to devices based on learned and predicted user behavior and by powering off devices based on sensor inputs. It also has the option of taking in user input to tailor the device towards user wants and needs. The Zotwatt project will be compatible with existing home entertainment systems (TVs, set-top-boxes, DVD players, audio devices, and game consoles). In the future, the device features can become built-in features of home entertainment systems since they all have time functions, IR receivers, and other sensors that we are implementing externally. Overall, the ZotWatt team hopes to provide an excellent energy saving solution for existing home entertainment systems.